People shop at the Spice market, also known as the Egyptian Bazaar, in Istanbul, Turkey August 17, 2018. 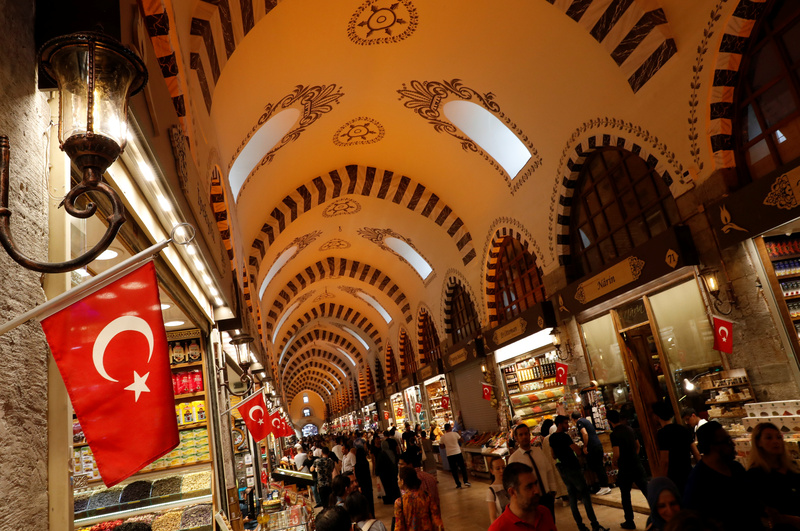 Turkey will continue directing its banks to withhold lira liquidity from a key overseas market at least until after local elections on March 31, three sources familiar with the matter told Reuters on March 27. The latest stop-gap measure to restore confidence in the lira boosted the London overnight swap rate to 700 percent, a record high and a massive hurdle to foreign investors looking to bet against the Turkish currency or hedge existing exposure. The country’s main BIST 100 Index was down 6.3 percent by 1445 GMT on March 27. The benchmark 10-year bond yield rose to 18.23 percent, its highest since October. Turkey's banking watchdog said on March 23 it had launched an investigation into JPMorgan and other banks over complaints it received after the lira plunged more than 4 percent and the main share index fell sharply a day earlier. The Capital Markets Board of Turkey also said it had launched a probe after receiving complaints that a JPMorgan report was "misleading" and caused speculation on the Istanbul bourse.